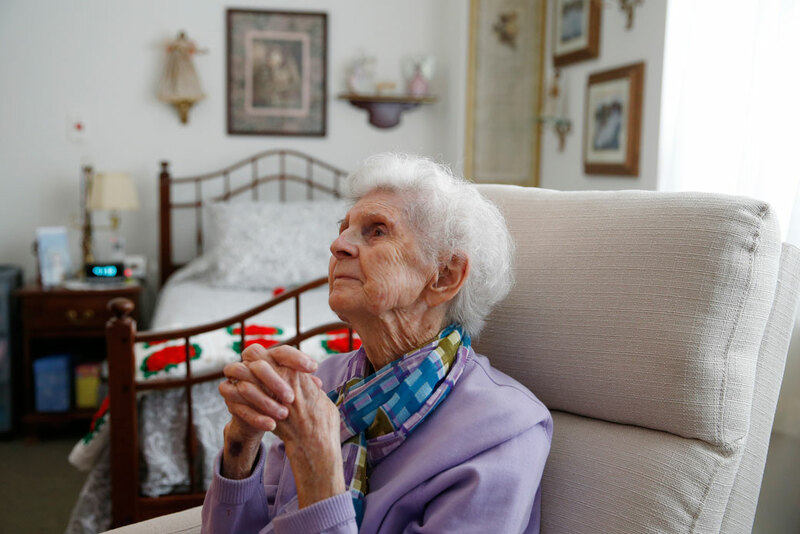 A 92-year-old woman sits inside her apartment in an assisted living residence in Marlborough, Massachusetts, March 2019. About 13 million Americans rely on some form of long-term care assistance,1 ranging from meal preparation and transportation services to round-the-clock care. The existing long-term supports and services (LTSS) system in the United States is wholly inadequate, with recipients—older adults and individuals with disabilities—often relying on both formal and informal care in a variety of settings. Moreover, even though the majority of LTSS recipients would prefer to receive care at home, the existing system often puts this option out of reach. There is also a need for far more direct care workers. Low wages, limited professional development opportunities, and demanding workloads have all hindered the appeal of joining the direct care workforce. They have also affected providers’ ability to retain workers. Moreover, insufficient training requirements leave direct care workers unprepared to care for clients with complex needs. Workforce shortages have been associated with poor quality of care as well as higher costs for patients and providers. As direct care workers take on even greater workloads to make up for staff shortages, mistakes become more common, resulting in patients experiencing preventable infections and accidents. Turnover among direct care workers can also cost the system thousands of dollars per worker.4 Initial investments in the direct care workforce present the opportunity for policymakers to improve quality of care delivered to patients in addition to reducing unnecessary costs—such as those incurred by turnover—over time. Strengthening the workforce can also help states expand access to home- and community-based services (HCBS), furthering efforts to improve patient satisfaction and increase the value for each dollar spent on LTSS. Not only does expanding access to home- and community-based care allow states to address the wishes of those who need LTSS, but it can also be a more efficient use of state and federal resources. The average annual cost of a private room in a nursing home was about $92,000 in 2016, while the annual cost of a home health aide working about 30 hours per week was $31,000 that same year.12 Of course, nursing home care is 24 hours a day, seven days a week, which explains some of the difference in costs; however, in cases where patients do not need round-the-clock support, HCBS can be the most cost-effective option. Despite significant progress in expanding access to HCBS, more than 650,000 people remain on a waitlist to receive these services—most of whom are individuals with disabilities.13 As technological innovations have allowed more nonelderly people with disabilities to live independently, HCBS have been essential in listening to the preferences of many of these individuals and moving them out of costly institutions. However, states continue to limit their HCBS programs, and many individuals with disabilities covered by Medicaid remain on waitlists for this type of care. Moreover, despite the fact that the overwhelming majority of older adults would also prefer to remain in their homes,14 many seniors still opt to receive care in nursing homes because of financial burden and limited providers. While family caregivers currently serve a key role in providing LTSS to individuals in their homes, changing family demographics are expected to influence the number of needed caregivers. Not only are the number of older adults increasing, but the size of American families is shrinking. As a result, there are an increasing number of aging adults who will not be able to rely on their children to provide the care necessary for them to remain in their homes. Recognizing that HCBS give patients the care they want, states have utilized a number of these methods to implement these services. In order to ensure all patients have the option to receive care at home, however, both state and federal policymakers should support efforts to increase the availability of direct care workers. Particularly as the demand for HCBS increases, it is critical that states work quickly to expand their workforce capacities. In order to address some of these inefficiencies, states have implemented value-based payment models and managed long-term supports and services (MLTSS) through their Medicaid programs. These payment and delivery reforms can be used to achieve a number of goals, ranging from reducing avoidable hospitalizations to increasing access to HCBS. Both types of reforms serve to increase patient satisfaction and reduce unnecessary costs. Implementing value-based payments can work to incentivize care coordination and to financially reward high-performing providers. Pay-for-performance in particular has been used to strengthen the direct care workforce by providing incentive payments to providers who meet benchmarks for workforce development and staff satisfaction.45 For example, pay-for-performance requirements can include guidelines to properly train and compensate staff. Significant progress has been made to encourage the use of alternative payment models in the health care system, which has reduced unnecessary health care costs and improved quality of care.46 While these payment models are relatively new in LTSS, some states have experienced positive outcomes by utilizing them to support workforce education and development initiatives. Pay-for-performance is a payment model that offers financial incentives for providers who meet certain quality domains. The report also highlights previous demonstrations that have yielded success: For example, Minnesota’s managed care program for dual-eligible beneficiaries ages 65 and older reduced enrollees’ likelihood of inpatient hospitalizations by 8 percent and emergency room visits by 6 percent, in addition to increasing the likelihood of enrollees utilizing HCBS by 13 percent.63 The authors concluded that managed care for these beneficiaries has successfully improved the transition from institutional to community care in addition to reducing hospital use and emergency department visits. New York’s experience exemplifies the need for constant state oversight and close coordination with the patient community. Like any other robust payment reform, quality and accountability measures must be in place in order to ensure that patients are receiving high-quality care. When transitioning to MLTSS, policymakers should establish clear, attainable goals and standards and keep open channels of communication with all of the relevant stakeholders: patients, providers, family caregivers, and payers. Several states have embedded value-based payments into their MLTSS programs. As part of the state contracts, MLTSS programs can utilize value-based payments to incentivize certain quality measures, including workforce standards. For example, Tennessee has implemented a pay-for-performance model under its MLTSS program, resulting in robust training and credentialing requirements for direct care workers. Under QuILTSS, the state’s Medicaid program, TennCare, sets reimbursement rates for nursing facilities based in part on a comprehensive score measuring the nursing home’s performance. The score is based on a number of quality measures, such as resident satisfaction, quality of life, and clinical performance. A key component of the score—accounting for 25 percent of the overall rating—is “Staffing/Staff Competency.” This includes quality measures such as staff retention, staff hours per day, staff training, and consistent staff assignment.74 These objectives are intended to measure staff satisfaction as well as the provider’s ability to retain direct care workers. Under the new reimbursement structure, TennCare MCO payments to nursing facilities include a quality incentive component valued at the greater of either $40 million or 4 percent of total nursing facility payments each year. Other components of the rate are also quality-informed, meaning performance can have a significant impact on a facility’s annual Medicaid revenue.75 Importantly, during the nearly five years since payments began, initial quality measures have showed significant signs of improvement. The growing need for LTSS—and patients’ desire to stay in their homes—requires investments today to build up the direct care workforce. In addition to implementing payment reforms, states can strengthen the direct care workforce by raising Medicaid reimbursement rates and increasing professional development opportunities. These initial investments not only work to improve quality of care, but they also increase worker satisfaction and can reduce unnecessary costs over time. Directly raising wages presents an opportunity to reduce turnover in addition to attracting more workers. Similarly, investing in professional development works to further professionalize the direct care field—making it more attractive to workers—and to improve the overall quality of care delivered to patients. Given the robust evidence that low wages are a barrier to recruiting and retaining workers, raising Medicaid rates is a wise investment for states seeking to increase access to HCBS. A 2018 Government Accountability Office review of HCBS in five states—Arizona, Florida, Mississippi, Montana, and Oregon—revealed significant shortages in the home care workforce, particularly in rural areas.83 All five states reported issues related to recruitment and retainment of direct care workers. Officials in Montana and Oregon reported low wages directly contributing to the limited availability of direct care workers.84 Unsurprisingly, residents in these states face significant barriers to receiving HCBS. In order to address shortages in rural areas and to increase the overall availability of direct care workers, officials from Mississippi and Montana reported increasing payment rates beginning in 2017. Mississippi raised payment rates for providers and agencies employing direct care workers in 2017, and the Montana Legislature approved funding to raise the hourly rate for workers in certain Medicaid HCBS programs that will take effect in 2019.85 With similar goals in mind, Arizona and Montana officials reported efforts to allow Medicaid beneficiaries to use Medicaid funding to pay family members for care.86 Not only do these initiatives attract and retain more workers, but they also serve as a sensible investment to help prevent rehospitalizations and other avoidable medical costs. However, raising payment rates alone is not enough to ensure that home care workers receive higher wages; states must ensure that additional payments result in higher wages specifically, instead of simply going toward administrative overhead or provider profit. To this end, some states have implemented wage pass-through requirements that direct these funds to direct care workers. States have utilized a variety of methods to meet the growing demand on the direct care workforce, including increasing funding for workforce development and training. According to a survey conducted by the Kaiser Family Foundation, 15 states raised wages for direct care workers in 2018, and 24 states reported plans to implement wage increases in 2019.87 A total of 22 states reported efforts to implement workforce development initiatives over the same two-year period.88 In addition to raising wages, states can also help reduce turnover by encouraging professional development opportunities in order to increase employee satisfaction and to professionalize the field. Strong training and credentialing requirements also work to improve the quality of care delivered to patients. In 2012, California received a grant from the Centers for Medicare and Medicaid Innovation to test a program titled “care team integration of the home-based workforce,” training an estimated 6,000 home-based providers.92 The demonstration was projected to save nearly $25 million by reducing emergency room (ER) visits and hospital admissions from the ER.93 The program also aimed to reduce the average length of stay in nursing homes by 10 percent.94 Results so far have been mixed, with some evidence of reducing emergency department visits but also some evidence of slight increases in hospitalizations and overall money spent.95 Building on the progress of this demonstration, states should review the available data and continue experimenting with methods that utilize workforce development to improve quality and control costs of LTSS. Workers who are employed by Medicaid consumers101 and those who are covered by the Service Employees International Union’s (SEIU) collective bargaining agreement can complete training requirements by attending the Training Partnership school.102 Established by SEIU 775, the Training Partnership offers classes both in person and online in 13 core languages, with interpreters available for additional languages.103 The content of the training ranges from skills such as physical emergency preparedness to conflict management and dementia care. At the end of the training, workers are given an assessment to determine credentialing.104 On any given day, the partnership trains more than 45,000 workers and it is the largest provider of certified home care workers in Washington state.105 The program also offers additional training and apprenticeship for individuals seeking advanced certification. When asked about the implementation of the program, state officials said that ongoing issues include meeting the needs of non-English speakers and working on disparities for workers completing the certification requirements.106 While results of the program—including turnover rates—are difficult to measure, officials noted that employers have reported that workers are better prepared for the job. As America’s population continues to age, an even greater strain will be placed on the long-term care system. As it currently stands, states are not prepared to meet this demand. Direct care workers are instrumental in meeting the daily needs of older adults and individuals with disabilities who require LTSS. It is critical to build up the long-term care workforce, which can improve the value of each dollar spent on LTSS, allow individuals to receive services in their own homes, and improve overall quality of care for patients. States should continue to strengthen the direct care workforce by implementing value-based payments, increasing wages, and investing in professional development opportunities. To build on these advancements, Congress should support states looking to develop workforce development initiatives through grants, waiver programs, and other dedicated funding. These wise investments are critical to improving quality of care while getting the best value for every dollar spent on LTSS. Madeline Twomey is the research assistant for Health Policy at the Center for American Progress. This publication was made possible in part by a grant from the Peter G. Peterson Foundation. The statements and the views expressed are solely the responsibility of the Center for American Progress.